The Cooler Master HAF XB EVO takes the famous High Air Flow series to a revolutionary new form factor with extreme cooling performance. The removable horizontal motherboard tray and large mesh top and front panels with two 120mm XtraFlo front fans create powerful front to back airflow. There is plenty of space for even the tallest high performance tower heatsinks, thick water cooling radiators, and up to 3 high-end graphics cards. 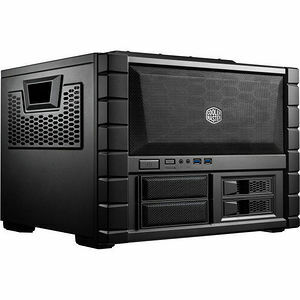 The side panels with their rigid carrying handles and the top mesh panel can be removed, transforming the HAF XB EVO into a test bench with direct access to internal hardware. The front panel features two USB 3.0 SuperSpeed ports as well as two X-Dock slots for lightning fast data transfers.